Today I'm participating in the CAS-ual Friday's challenge (CFC46) - Name that Tune (be inspired by a song title or lyrics). I chose "The Rose" by Bette Middler. I do love making roses ... and used the paper tole technique to build a very simple rose from the Embrace Life stamp set by Stampin' Up! Hope you like. I inked the En Francais Stamp with Sahara Sand and stamped onto Whisper White cardstock. I inked the stamp with Old Olive and Regal Rose Stampin' Write markers and stamped over top of the script. I sponged a scrap of Whisper White cardstock with Pretty in Pink ink for a soft color. I stamped the rose flower head three times overtop in Regal Rose ink. I cut out one of the whole flower heads and sponged Regal Rose ink around the outside edges with a small, eye-makeup wand. I glued the flower head on top of my main panel. I cut out the second flower head, this time just cutting the two center pieces (cutting off the three outside petals). I sponged Regal Rose ink around the outer edges and then mounted it on top of my first flower head, adding Tombow glue at the base and a rolled glue dot at the tip (giving the rose dimension). I finally added the third flower head, this time just cutting the one main center piece, sponging Regal Rose around the outer edges and mounting it on top of the other two layers, again adding Tombow glue at the base and a rolled glue dot at the tip. I sponged Old Olive around the outer edges of the main panel and then mounted onto a frame of Old Olive cardstock. Using the Stamp-a-ma-jig for placement, I stamped the sentiment in Old Olive ink onto my Whisper white card front. I added three mini half pearls under the sentiment. I mounted the main panel to the card front, popping it up with dimensionals. I mounted the card front onto a card base of Old Olive. Labels: CAS, friendship, paper piecing, paper tole, Stampin' Up! Love the way you cut out the flower heads and layered them! Gorgeous card. Such a lovely card! I love the image and the great background! So nice! Such a great idea to make the flower dimensional. It really stands out. Great song and such a beautiful interpretation of it! Thanks for playing at CAS-ual Fridays! Love Bette Midler! 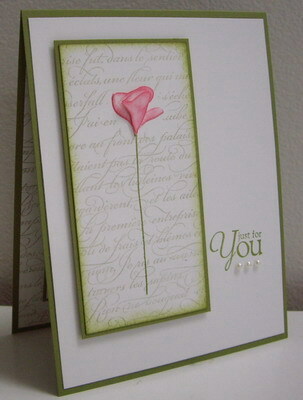 And this card is a gorgeous rendition of a beautiful song. I love the drama of the single flower against the text background. Very elegant. what a delicate and elegant card. I love it!